I have another special treat on the blog - a guest post from illustrator Sandra van Doorn, as part of the Sing to the Moon blog tour. This now makes two guest posts on the blog, so I am now triply excited - is triply a word? 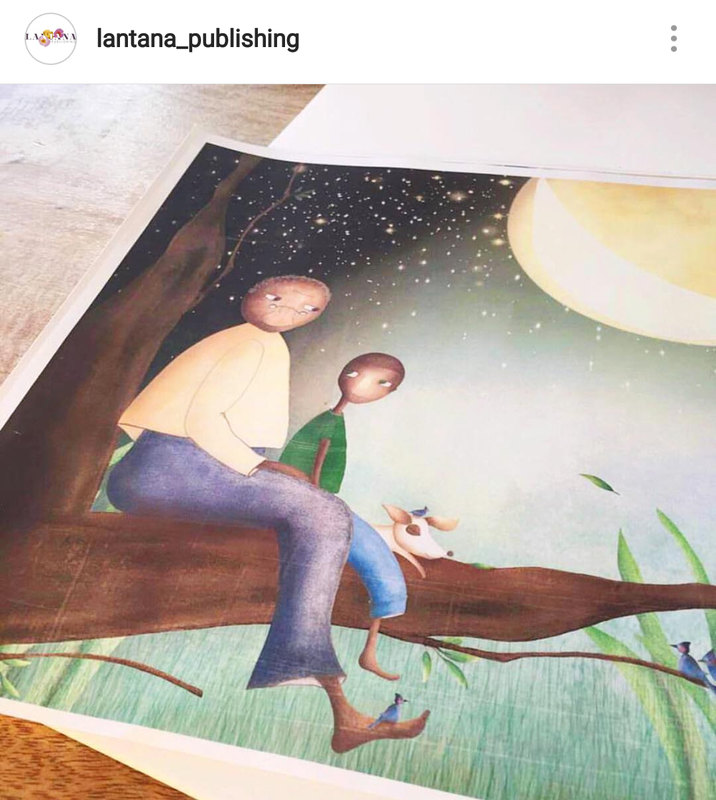 I am obsessed with illustration and design - so there was no way I was going to miss out an opportunity to have Sandra van Doorn share the process behind the illustrations created for Sing to the Moon. Thank you Sandra for the guest post. Sing to the Moon written by Nansubuga Nagadya Isdahl with illustrations by Sandra van Doorn is out October 11. I think illustration should always go deeper than the text. A book is a magical world and it is important to create a wonderful universe for a character, invite our readers into a special place. In many ways illustration is similar to creating a movie scene. I always ask myself - where is the light coming from? What mood do I want to create? What is happening to the main character, but also what else is going on simultaneously. 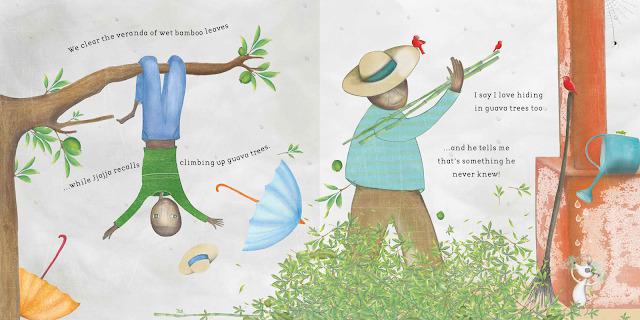 My favourite spread to illustrate this concept in Sing to the Moon is the veranda scene. While Jjaja is clearly busy working, the boy has his version of helping - he is having tons of fun climbing a tree – while the little white dog is always up to some mischief. I usually sketch and colour with dry pastels, on thick cartridge paper. I like a smooth finish, so there is much blending involved. Detailed work such as drawing birds or leaves is very time consuming. So depending on the complexity of the illustration it can take up to 3 days to finish one spread. Once my drawing is done I scan it and digitally adjust some colours and add a background which I create separately with pastels too. At this point I might decide to add a bird, or an insect or a flower - which I would draw and add as a layer in photoshop. I try to stay as close to the real image as possible, but if I feel some colours should stand out a little more I do that with photoshop.